The International Pilgrim Image of Our Lady of Fatima will visit the Philippines from January 28 to February 21, 2009. This is the authentic pilgrim image of Our Lady of Fatima approved by Sr. Lucia (one of the 3 visionaries of Our Lady of Fatima) to be used as the pilgrim statue. It has journeyed all over the world since 1947. To prepare us for this important visit, CFC-FFL presents this series. Let us continue to put Mary in the heart of our community life. It is a special privilege to have Our Lady visit us. Christ the King Greenmeadows Ave. The history of the International Pilgrim Image of Our Lady of Fatima begins in 1946. After the youth of Portugal attended a Congress in Fatima, they took the statue that was on display at the Cova de Iria on a pilgrimage to Lisbon. As they walked the route, people gathered at each town to pray. As the image entered the cathedral in Lisbon, the miracle of the doves occurred. Many other phenomena occurred inspiring devotion and fervor among the people. The statue was returned to the Cova de Iria but may people wished for a visit to their own communities. The Bishop then asked Sr. Lucia, the only living visionary at that time, in a letter about sending the statue on tour. Sr. Lucia responded with a letter suggesting a new statue which was by then being made by the famous sculptor, Jose Thedim, be used as the pilgrim image. Upon agreeing, the Bishop blessed and named the new statue the International Pilgrim Image of Our Lady of Fatima. The date was May 13, 1947. Almost before it began its journey, so many places were asking for her visit that it was realized that a second statue had to be made. The second statue was also made by Jose Thedim. It was completed and blessed by the Bishop of Fatima on October 13, 1947 (Exactly 30 years to the day after the great miracle of the sun which drew the world’s attention to Mary’s message). The atatue has always had a full time custodian and has never stopped travelling in its entire 54 years. Physical cures attributed to the presence of the statue have been documented many times. The changes in the expression and coloration, and even the pose of the statue have been reported innumerable times. The important miracles though are the spiritual cures and gifts Our Lady bestows. Examples include the conversion of a stubborn heretic and the enlightenment of someone who resisted the idea of statues or the idea of praying to saints. The spiritual miracles are infinitely more than the things we can see, touch, or measure. The Blessed Virgin Mary, the Mother of God, appeared six times to three shepherd children (Lucia, Jacinta, and Francisco) near the town ofFatima, Portugal between May 13 and October 13, 1917. Appearing to the children, the Blessed Virgin told them that she had been sent by God with a message for every man, woman and child living in our century. Coming at a time when the world was torn by war and bloody violence, she promised that Heaven would grant peace to all the world if her requests for prayer, reparation and consecration were heard and obeyed. Our Lady of Fatima explained to the children that war is a punishment for sin and warned that God would further punish the world for its disobedience to His Will by means of war, hunger and the persecution of the Church, the Holy Father and the Catholic Faithful. God's Mother prophesied that Russia would be God's chosen "instrument of chastisement," spreading the "errors" of atheism and materialism across the earth, fomenting wars, annihilating nations and persecuting the Faithful everywhere. "If My requests are not granted, Russia will spread its errors throughout the world, raising up wars and persecutions against the Church. The good will be martyred, the Holy Father will suffer much and various nations will be annihilated." In all her appearances at Fatima, the Blessed Mother repeatedly emphasized the necessity of praying the Rosary daily, of wearing theBrown Scapular of Mount Carmel and of performing acts of reparation and sacrifice. To prevent the terrible chastisement at the hands of Russia and to convert "that poor nation", Our Lady requested the solemn public Consecration of Russia to Her Immaculate Heart by the Pope and all the Catholic bishops of the world. She also asked that the Faithful practice a new devotion of reparation on the first Saturday of five consecutive months. 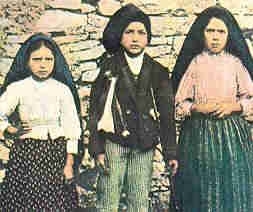 Of the three shepherd children who witnessed the apparitions of the Blessed Virgin at Fatima, Sister Lucia dos Santos, died in February 13, 2005 at the age of 97 years in the convent of her order in Coimbra, Portugal. As Our Lady predicted at Fatima, both Francisco and Jacinta Marto died several years following the apparitions and are now candidates for sainthood. Heart of Mary so much!" After two months in hospital, she returned home whereupon an open and ulcerous sore was shortly discovered on her chest. Soon thereafter she was diagnosed with tuberculosis. Over the course of the next year, she suffered grievously for Our Lady. "Will Jesus be content with the offering of my sufferings?" , she asked Lucia. In February of 1920, she was rushed to another hospital, this time in Lisbon. Wasting away to a virtual skeleton and dying without the presence of her beloved parents or Lucia, she consoled herself with the thought that this, too, was yet another chance to offer up her suffering for sinners. In the Lisbon hospital she was visited no less than three times by the Mother of God. LUCIA DOS SANTOS was born on March 22, 1907 to Antonio and Maria Rosa dos Santos. The cousin of Francisco and Jacinta, she was the youngest of seven brothers and sisters and the oldest of the three little shepherds. From infancy, she was recognized as especially precocious and was a particular favorite of young and old alike. Gifted with an open, cheerful temperament and lively intelligence, she organized games, prayers, dances, and other initiatives among the children of the village. Her sufferings began immediately after the first apparition of the Virgin. She became the principal target of criticism on the part of her family and their friends to the point that she was greatly reluctant to return again to the Cova da Iria for the appointment with Our Lady on the 13th of July.The parish priest of Fatima actually insinuated that she could be a "little instrument of the devil." It was only at the insistence of the other seers that she overcame her fears and journeyed to the Cova as the Blessed Virgin had requested. Lucia’s other great moment of suffering came when Our Lady told her that She would soon carry Francisco and Jacinta to Heaven and informed her that she was to remain alone on earth, to spread the devotion of the Immaculate Heart of Mary. 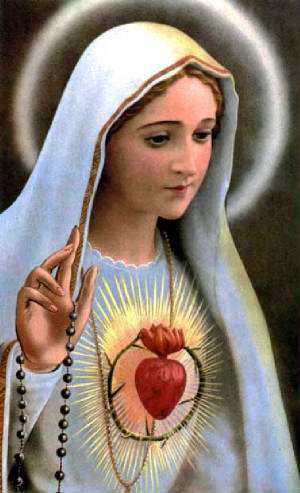 But the Virgin comforted her, "MyImmaculate Heart will be your refuge and the way which will lead you to God." It was Lucia who spoke with the Queen of Heaven, who presented requests of favors on the part of many people and who requested a miracle so that all would believe the apparitions. It was also Lucia who, when they were placed in prison on the 13th August 1917, organized the resistance to the threats and flatteries of the authorities, which had the purpose of discovering the Secret revealed by Our Lady. And when Francisco and Jacinta fell ill, it was again Lucia who assisted them lovingly until the end. In 1921, on the decision of the Bishop of Leiria (the Diocese of Fatima), Lucia was sent away from her village of Aljustrel and taken immediately to the Dorothean Sisters of Villar in Oporto. It was believed that her presence at Fatima could obstruct the impartiality of the investigations then being undertaken to determine the validity of the apparitions. In addition, the 14-year-old Lucia had been the subject of almost continuous harassment and interrogation by friends and enemies alike of the apparitions. In the year 1928, Lucia became a sister of Saint Dorothy and, later in 1946, after a brief visit to Fatima, she entered the convent of the Carmelite Sisters of Coimbra, where she remained until her death in February 2005, under the name of Santa Maria Lucia of the Immaculate Heart. Today, Lucia is already in that same Heaven where her cousins Francisco and Jacinta are together with Our Blessed Mother. The Catholic Church has endorsed the Fatima Message since 1930. Five successive Popes have publicly indicated their approval of the apparitions of Our Lady at Fatima and Her message. Two Popes went to Fatima on Pilgrimage. Pope John Paul II went there twice, once on May 13, 1982 and again on May 13, 1991. As a great sign of this whole message truly coming from God, a marvelous miracle was worked in the sky above Fatima before 70,000 witnesses on October 13, 1917, at the time, date and place that Lucia and the other two children had prophesied in the name of Our Lady of Fatima. As also prophesied, Francisco and Jacinta died in the odor of sanctity in 1919 and 1920. Lucia became a Carmelite Sister. Sister Lucia just passed away in February 13, 2005. She was 97 years old. Our Lady of Fatima continues to work miracles today through Fatima water which is sent from Fatima around the world. This Fatima water sprang up in Fatima at the spot the Bishop told people to dig, very near where Our Lady appeared at the Cova da Iria (the Cove of Peace) in Fatima. Still other people are cured when they go on pilgrimage to Fatima, which is about 90 miles north of Lisbon, Portugal. When he went to Fatima, Pope John Paul II himself said: "The Message of Fatima is addressed to every human being." If we do not heed Her soon, then Our Lady’s terrifying prophecy may well be realized in the near future even in our own homes. Our Blessed Mother told us that God had chosen to use Russia as the instrument of chastisement to punish the whole world if we did not, by our prayers and sacrifices, and obedience to Her requests (especially those requests for Consecration and Reparation) obtain the conversion of Russia to the Catholic faith. She promised us, "If my requests are granted Russia will be converted and there will be peace". But Our Lady also warned us, "If my requests are not granted, Russia will spread her errors throughout the world raising up wars and persecutions against the Church, the good will be martyred, the Holy Father will have much to suffer, various nations will be annihilated." In order to prevent these chastisements from befalling us, Our Lady told us that special reparation for sins committed against theImmaculate Heart of Mary was necessary, particularly the Communions of Reparation on the First Saturday of five consecutive months and the public and solemn Consecration of Russia to the Immaculate Heart of Mary by all the Catholic Bishops of the world, together with the Pope on the same day at the same hour. Finally Our Lady’s message is a promise of the eventual triumph of her Immaculate Heart over evil. She promised that no matter how black it might get in the future (and it seems that is the path chosen by most of humanity today) that in the end she will triumph, Her requests would finally be granted by mankind and there will be world peace. The devil knows that when Our Lady’s full Fatima Message is widely proclaimed, properly understood, loved and obeyed then his evil empire on earth will be destroyed. So the devil and his human agents, and well meaning but terribly misguided people that serve them have launched a counter-offensive against the Fatima Message to obscure it and cause enough confusion so that the Faithful do not obey Our Lady and react in time. She is relying on all of us to do our part. At least all of us can pray the Rosary. All of us have some special need or intention to ask Our Lady’s powerful intercession. Pray to Our Lady of Fatima and she will help us. She will also richly reward us for all that we dodo to make known and understood Her maternal message of love and warning given at Fatima. As CFC-FFL is consecrated to Our Lady, let us continue to be instruments of peace and hope in the world. Let us continue to be instruments for the triumph of Our Lady’s Immaculate Heart.